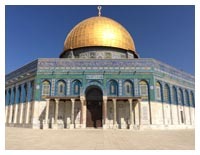 14 day tour, hotels, two meals a day, private motor coach, and Israeli guide. Since most who go to Israel can do it only once in their lifetime, see basically all Biblical related sites that are accessible. After creating and successfully leading this tour 15 times from 2005-2018, once again this will be led by John Hodges (Van), an experienced traveler who has visited Israel 22 times in the last 21 years, plus much of the Middle East. He is a graduate of Moody Bible Institute, and has been a student and teacher of the Bible, Israel, Biblical history, and Bible prophecy for many years. This is an excellent private group leader tour for laypersons, retirees, students (high school, college, seminary), and pastors. For additional information, contact John Hodges at: hodges777@gmail.com or 708-331-4440. Limited Space – Reserve Early! This package is not eligible for Pilgrim Tours discount offerings. Israel in Depth Price Includes: 12 nights lodging in 4 star hotels, breakfast and dinner daily, Abrahamic lunch, full time English speaking Israeli tour guide, ear whisper systems, porterage (1 Bag), services of long distance deluxe motorcoach as appear on itinerary, all guides, entrances and transportation as appear on itinerary, transfers (see below). Israel in Depth Not Included: Flight arrangements (low cost fares available nationwide) lunches, optional Travel Insurance, optional credit card payments (additional 3% surcharge of total bill, airfare is exempt from surcharge), Gratuities will be paid in advance ($144.00 per person will be added to your final invoice for gratuities to be paid to driver, guide, and hotel staff while in Israel). Arrival & Departure Transfers: For arrivals on Sunday May 19, your flight needs to arrive before 4:50PM to ride the tour bus to the hotel. For departures for the main Israel Tour only, the bus departs the hotel on Friday May 31 at 7:45AM, arriving at Ben Gurion Airport about 9:00AM. Check in for return flights begin 3 hours before departure times. If another time is desired for airport transfers, a private transfer may be secured for a nominal fee. Contact your Pilgrim Agent for pricing. Jordan/Southern Israel Extension Not Included: All air flights and air taxes, lunches, optional travel insurance, ear whisper systems, optional credit card payment (additional 3% of total bill). June 3rd flight from Eilat approximate $150.00 (subject to confirmation). Samaria/Hebron Extension Not Included: Lunches, optional travel insurance, ear whisper systems, optional credit card payment (additional 3% of total bill). Samaria Departure Transfers: For airport departures the bus leaves the hotel on June 6 at 8:30AM, arriving at Ben Gurion Airport at 9:00AM. Check in for return flights begin 3 hours before departure times. If another time is desired for airport transfers, a private transfer may be secured for a nominal fee. Contact your Pilgrim Agent for pricing. Final Payment: 60 days before departure. Depart from home for an overnight flight to Israel. Tour members arrive in Tel Aviv at Ben Gurion Airport, then by motor coach we drive past Lydda, Emmaus, and the Aijalon Valley on a scenic drive up to Jerusalem and arrive at our hotel for our first dinner together and a six-night stay. We begin the day by touring the City of David to see a film, its Canaanite and Israelite ruins, Jeremiah’s Cistern, an optional walk thru Hezekiah’s Water Tunnel, view recently discovered 2nd Temple road, finishing at the Pool of Siloam where Jesus healed a blind man. For lunch we have a Biblical type dinner in Abraham’s Tent. We drive further east thru the West Bank and Judean Wilderness to stop for a scenic view of the Wadi Qelt, St. George’ Monastery, and ancient Jericho Road. We continue on past Bedouin camps to Jericho to see Herod’s winter palace, Zaccheus’ sycamore fig tree, Elisha’s Spring, then enter ancient Tel Jericho to see remains of fallen walls, and view the Mount of Temptation where Satan tempted Jesus. This day begins with a stop at ancient Gibeah where King Saul had his palace. 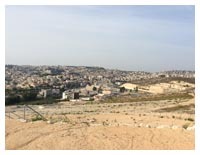 We then travel to West Jerusalem to the tomb of the prophet Samuel and a view of his hometown Ramah, and the high place at Gibeon where the Lord appeared to King Solomon before he built the Temple. We continue westward to visit a possible location of Emmaus where Jesus appeared to two disciples. We walk to a scenic view of the Aijalon Valley where Joshua prayed for the sun and moon to remain still. We drive past Lydda where Peter healed a paralyzed man and arrive at the ancient port of Joppa where Jonah and Peter spent time. We return to Jerusalem and pass under the Harp Bridge, then take a somber tour of the Holocaust museum at Yad Vashem. We end the day by going past the Knesset to visit the Israel Museum, Shrine of the Book (Dead Sea Scrolls), plus see a model of1st Century Jerusalem. Today we ascend on top the Temple Mount to observe columns and steps from the Temple where Jesus taught, Al-Aqsa Mosque, the Dome of the Rock shrine, the Golden Gate, then exit to the Pool of Bethesda where Jesus healed a paralyzed man. We see a stone pavement from the Roman times then walk the 14 stations of the Via Dolorosa to the Church of the Holy Sepulchre. Our next stop is at the Promenade for the view that Abraham first had of Mt. Moriah. We then continue on to Rachel’s tomb, as we enter into Bethlehem to tour the Church of the Nativity that displays where Jesus was born, shop at the olive wood factory, then by bus we visit, David’s well, the Shepherd’s Field, ending at Herod’s palace and tomb at Herodium. With excitement we begin our extensive tour of the Old City of Jerusalem by visiting the Wailing or Western Wall and walk thru the excavated Rabbinical Tunnel to see a massive Herodian stone wall and street from the time of Jesus. 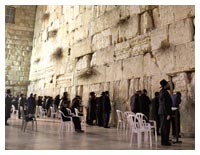 We then witness the many Bar Mitzvah celebrations at the outside wall and have an opportunity to pray there. Strolling to the Archaeological Park we see a film, original 2nd Temple stones, and southern steps that Jesus walked on. Ascending up to the Jewish Quarter we see the gold Menorah built for the next Temple, the Temple Institute, the Burnt House, a 1st Temple period model of Jerusalem, a wall built by King Hezekiah, and the Roman Cardo. The rest of our day is at Mt. Zion to see the Upper Room, David’s Tomb, and the first Church Grotto. This final day in Jerusalem begins with an ascent to the top of the Mount of Olives for a breathtaking view of the Dome of the Rock, Jerusalem, Bethphage, and Bethany. We view the large Jewish cemetery and tomb of the prophets Zechariah, Haggai, and Malachi located on the mountain in expectation the Messiah will come there. We remember the last week of Jesus’ life on earth and descend the Messianic path where He rode on a donkey, visiting where He wept over Jerusalem, then tour the Garden of Gethsemane where He was arrested, then walk across the Kidron Valley to ancient tombs. We continue up to the Temple Mount and high Pinnacle Wall where Satan tempted Jesus when He began His ministry. Next we enter David’s Citadel and go to the top of a tower for a view of Old Jerusalem and to see the remains of Herod’s palace and possible place of Pilate’s trial of Jesus. Our next stop is to enter Caiaphas’ House to see a 1st Century road and prison where traditionally Jesus was put on trial by the high priest and where Peter denied knowing Him. 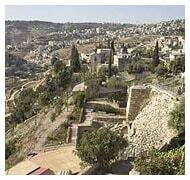 We overlook the Hinnom Valley, also called Gehenna, and the Potter’s Field where Judas was buried. The afternoon finishes with a quiet visit, tour, and communion together at the Garden Tomb and Place of the Skull called Golgotha or Calvary. Leaving Jerusalem we stop at Ein Kerem the traditional birthplace of John The Baptist, then drive past Hadassah Hospital named after Biblical Esther. We travel west thru beautiful mountains and the Sorek Valley to Beth Shemesh where the Ark of the Covenant was carried from the Philistines by two cows pulling a cart. The next stop is Tel Azekah and the Valley of Elah, where David defeated Goliath. We make stops where battles were fought at Mareshah and Lachish, then we drive thru the land of the Philistines, passing the city of Gath. We continue on to Beersheba and see Abraham’s well. Next, we go east with a drive thru the Negev contrasted with Bedouin tents and herds of camels, donkeys, sheep, and blossoms of the Israeli desert agriculture that is fulfilling prophesy from Isaiah. Our desert tour ends with stops at the traditional locations of Biblical Arad, Zoar, Sodom, and salt stone of Lot’s wife, then a relaxing swim in the Dead Sea by our luxurious hotel. We see a film and ascend by cable car to the ancient fortress of Masada. After digesting its history and viewing ancient Gomorrah, we drive to the oasis of Engedi where David hid from King Saul, then on to Qumran, where the Dead Sea Scrolls were found. We head north and stop at the Baptismal Site where Jesus was probably baptized at Bethany Beyond The Jordan, we then continue thru the Jordan Valley and Samaria, to visit Belvoir Fortress. We soon make our first drive along the shore of the Sea of Galilee past ancient Roman ruins and a theatre before entering the city of Tiberias (known for its Roman hot springs which still exist today) to begin a four-night stay at a lakeshore hotel. We go north today thru the Hula Valley with a stop at Tel Hazor, seeing mud brick ruins from Canaanite times, stone structures built by King Solomon, and a huge water well built by King Ahab. Next we see a film about migrating birds at the Hula Nature Reserve. We continue north to see the headwaters of the Jordan River at Tel Dan, plus we see the ancient Israelite city of Dan. Back on the bus, we visit Banias and its Hermon Stream (Biblical Caesarea Philippi where Jesus visited), then we ascend up Mt. Hermon to tour Nimrod’s Castle with a beautiful view of the Hula Valley. Our bus continues on to the picturesque volcanic crater at Lake Ram and then ascends up Mt. Bental with a magnificent view of snowcapped Mt. Hermon, Lebanon and Syria. The day ends by driving thru the Golan Heights of ancient Bashan with a stop at a high observation point for a panoramic view of the Sea of Galilee. We arrive back at Tiberias. Today we concentrate on the primary places of Jesus’ ministry. We take a quiet cruise on the Sea of Galilee in the Jesus Boat, and then disembark to tour the Boat Museum. Next, we visit Magdala, the Mount of the Beatitudes, Tabgha, Capernaum, Chorazin, Bethsaida, the miracle feedings of the multitudes and the place of the demoniacs and pigs at Kursi, Hippos, and Gadara. Our final stop is for water baptisms to be done at the Jordan River baptismal site. We finish our complete circle of the lake by arriving back at our lakeshore hotel. We begin by heading south to visit the extensive Roman ruins and Tel of the ancient city of Beth Shan. We then drive up Mt. Gilboa to where King Saul was killed, to take pictures of the fertile Beth Shan Valley. We drive thru the Jezreel Valley passing by Shunem where Elisha raised a boy from the dead, and by Ophrah where Gideon resided. We ascend Mt. Precipice for a view of Nazareth, Mt. Tabor where Deborah defeated the Canaanites, and northern Armageddon. After driving by the Church of the Annunciation, we have a guided tour of Nazareth Village. Next, we go to the close by ancient city of Sepphoris where likely Joseph and Jesus worked as builders. Leaving the area, we drive thru Cana where Jesus turned the water into wine, and end the day at Mt. Arbel for a spectacular view of the Sea of Galilee. Back on the bus we make a final scenic stop overlooking Tiberias along the lake. We return to our hotel. On our last day in Galilee, by bus we pass thru the Biblical places of Kadesh, Mt. Moreh, Mt. Tabor, Endor, and Nain. We stop at Harod Springs where Gideon downsized his army to 300. Our next stop is at Tel Jezreel in the Jezreel Valley, the city of Ahab and Jezebel. We continue to travel west to take a tour of ancient Tel Megiddo, overlooking southern Armageddon. We then ascend to Elijah’s Mt. Carmel where he dueled with the 450 prophets of Baal. We have a wonderful western view of the Jezreel Valley. We descend back down the mountain to our last stop at the ancient seaport and Roman Capital of Biblical Caesarea, where Pontius Pilate resided. This was also where Peter preached to the Roman Centurion Cornelius and saw the entire household believe. Paul was put on trial here before sailing for Rome. We drive outside the city to take pictures of its ancient Herodian Roman aqueduct. We then drive thru the Sharon Plain to our hotel perched on cliffs overlooking the beach and Mediterranean Sea for one last night in Israel and for reflections about everything that we have seen and heard. Some members leave from Ben Gurion airport on their return flight home with lots of great memories and information, while others will continue on the Jordan/Southern Israel Extension. If you do this tour and all the extensions you will see almost all of Israel and its Biblical sites. An early departure from our hotel in Netanya, Israel takes us to Sheikh Hussein Bridge. After meeting our guide and completing passport formalities, we enter the Hashemite Kingdom of Jordan. By motor coach we travel to a scenic overlook of Pella, where the Jerusalem Church fled in 65 A.D. We then continue to Jordan’s northern border driving thru the picturesque Yarmouk River Valley as we ascend to visit the ancient ruins of Gadara, the mountain top city center of the Gadarene Demoniacs. From there we can see the Sea of Galilee where Jesus had His encounter with them. We head back south to Jerash, ancient Gerasa of Roman Times, the city center of the Gerasenes, one of the best-preserved and most complete provincial Roman cities. Gerasa was one of the cities of the Decapolis, a confederation of 10 Graeco-Roman cities dating from the 1st century BC situated in Jordan, Syria and Israel. Known for its extraordinary state of preservation, the ruins indicate human occupations at this location for more than 2,500 years. The most well-known monuments include the colonnaded street with sewers, the Temple of Zeus, the theatre, the Forum, and Hadrian’s Arch. Next, we drive further south thru the area that once was settled by the ancient Ammonites and Amorites, but later became part of ancient Israel where 2½ tribes settled. We cross over the Jabbok River where Jacob wrestled with God, then past the present capital of Amman, which once was the Decapolis city of Philadelphia and Old Testament Ammonite city of Rabbah. We arrive at our luxurious hotel by the Dead Sea with an optional swim in the Sea or hotel pools. We begin the day with a visit to Bethany Beyond the Jordan, where John The Baptist did some baptizing and likely spot where he baptized Jesus. It was in this vicinity that the Prophets Elijah and Elisha did some ministry, and where Joshua and the Israelites crossed into the Promised Land thru the parted Jordan River. We take a leisurely walk thru the thickets to see John the Baptist Spring and then we continue to the Jordan River. As we exit we see the hill where tradition says Elijah was taken to Heaven. By bus we then follow the reverse path of the Israelites on their way from the wilderness to the Promised Land. We ascend to the top of Mount Nebo to visit where it is believed Moses saw the Promised Land and was buried in the adjacent valley. Our drive continues to the town of Madaba, the biblical Medeba, where we see the well preserved ancient mosaic map of the Holy Land. Next we drive south onto the Biblical King’s Highway. Soon we leave the main highway for a distant picture stop of the mountain palace of Herod Antipas where tradition says he beheaded John The Baptist. Returning, we make a brief stop at ancient Biblical Tel Dhiban, then continue driving south to the ancient border of Moab for a picture stop at the Arnon River Canyon. We then head east and enter the Desert Highway traveling south thru ancient Edom. We stop to see Moses’ Spring and then arrive at Petra where we overnight. This morning we make a complete visit of Petra where we walk or take optional carriages thru the “Siq”, an immense colorful sandstone canyon, to the city of ancient Petra. Over 2000 years ago the Nabateans carved this city out of the rose red rock. The Treasury or El Khazneh, is one of the most elegant remains of antiquity. The canyon walls on both sides have hundreds of carved and built structures, and further in we see the conquering Romans also added structures to the city. We also offer an optional walk up the 852 steps to the Monastery. As we leave Petra in the afternoon, we make a picturesque stop to see Petra from a distance and Mount Hor where tradition says Aaron, Moses’ brother was buried. Our next stop is at Wadi Rum for a tour to see the breath taking beauty in the park. Our time in Jordan soon ends as we head south into ancient Midian, where the fugitive Moses settled for forty years. We arrive near the Red Sea or Gulf of Aqaba at the outskirts of Aqaba, Biblical Ezion Geber, where King Solomon based his fleet of ships. We arrive at the Arava Border to cross into Israel and drive to Eilat on the Red Sea shore, which is Biblical Elath, for a one night stay at our hotel. Today we visit the National Park Fish Observatory to see aquatic fish in their natural habitat among coral reefs. Next, we drive north to visit a life-size Biblical Tabernacle model and see beautiful rock formations in the area of closed copper mines from the times of King Solomon and the ancient Egyptians. We have a short flight to Tel Aviv late this afternoon where we then head for our hotel to begin the Samaria/Hebron Extension. We arrive late afternoon at our hotel in Ariel. Ariel in Hebrew means “lion of God” and the city was founded in 1978. In the Bible, Ariel was another name for Jerusalem (Isaiah 29:1-8). 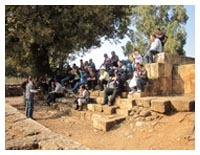 We begin the day by driving south to the extensive ancient ruins of the Biblical city of Shiloh perched on a mountain. We see a film there and have a guided tour of the excavated ruins where the Mosaic Tabernacle once stood for many years, with this structure being the center of Israelite worship. This was also where Samuel the prophet grew up as a child under Eli the High Priest. Leaving Shiloh, we drive nearby where traditionally Eli was buried. Near here was Biblical Aphek and Ebenezar where the Israelites were defeated by the Philistines who also captured the Ark of the Covenant. Later the Philistines destroyed Shiloh. We then drive further to climb by bus another mountain which is called the Mountain of Abraham or Elon Moreh (oak of Moreh). This was where God made his first appearance to Abraham after he entered the promised Land. From here we have a fantastic view of all of Samaria. We then drive up the adjoining mountain to the National Park at the top of Mount Gerizim where Joshua promised the Israelites blessings from God for obedience. While up there we visit a modern day Samaritan temple where Samaritans still perform animal sacrifices. We then travel by bus part way up traditional Mt. 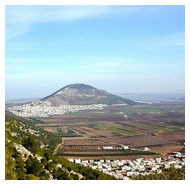 Ebal which is the mountain where Joshua pronounced curses on Israel if they disobeyed God’s Word. The next drive is into Biblical Shechem where Jacob bought a piece of land to pitch his tent and there we visit Jacob’s Well. Nearby, the bones of his son Joseph were buried there when the Israelites entered the Land after the Exodus and we visit his tomb. This is also the place of Sychar where Jesus talked to the Samaritan woman. We visit Tel Balata where we see ancient Canaanite ruins and altars traditionally attributed to Abraham and to Joshua where he pronounced the blessings and curses over Israel. Our next stop is at the ancient ruins of the Biblical city of Samaria or Shomron, with the same name as the region it was located in and was its ancient capital. We see where King Ahab’s ivory palace once stood. Our final stop will be to see the traditional tombs of Joshua and his good friend Caleb, the only two spies who came back with a good report and were allowed to enter the Promised Land 40 years later. We have a short drive to our hotel. We leave our hotel and head south where we pass on our left Ai one of three Canaanite cities Joshua burned. Our first stop for the day is at Bethel (house of God) which was named by Jacob after he had a vision here of a stairway reaching to Heaven and saw angels and the Lord around it. Then the Lord spoke to him and reaffirmed His covenant promise of the Land and future generations. Later, God appeared again to him here and changed his name from Jacob to Israel. Next we make a picture stop at the Michmash Valley where King Saul’s son Jonathan defeated the Philistine garrison. Back on the bus we pass by Biblical Geba where Saul camped with his army, then we go by Ramah the hometown of Samuel the Prophet. We then pass Anathoth, a city of priests where Jeremiah lived. We leave Samaria and arrive at Bethany to see the traditional location of the home of Lazarus and the tomb where he was raised from the dead. We walk nearby to see the ruins where the house was located of Simon the leper who entertained Jesus at His last Shabbat evening meal when Mary anointed Him before His crucifixion. Back on the bus, we drive past Tekoa where the prophet Amos was a shepherd. We continue on to the city of Hebron to go inside the building Herod The Great built over the original cave tomb of the Patriarchs and their wives Abraham/Sarah, Isaac/Rebekah and Jacob/Leah. We then drive to the traditional location of the Oaks of Mamre where Abraham pitched his tent and built an altar to the Lord. Back on the bus we make a stop to take pictures of the large ancient Solomon’s Pools that Herod expanded to store the water to feed his aqueducts that ran to his palace at Herodium and to the Temple Mount at Jerusalem. Our last visit of the day is for a relaxing Biblical meal based on the Last Supper Communion that Jesus had with His disciples. There will be a lecture about the cultural and Biblical symbolisms that were expressed during that original meal. The day ends with our last relaxing stay at a lodge in the quiet picturesque countryside of the Judean hills. We depart for Ben Gurion Airport for our return flight home with lots of great memories and information. For additional information, contact John Hodges at: hodges777@gmail.com or 708-331-4440.